**Disclosure: I did receive complimentary product to facilitate a review. All opinions are my own. Brining is definitely not a new method of preparing meats, but it seems be a trend in the food world as of late...or maybe I'm just becoming more aware of it. A lot of posts regarding brining have been showing up in my feed. When Meatheads opened a location not far from me and I visited with their marketing rep on opening day, I learned that they brine their chicken tenders in pickle juice - and let me tell 'ya, those are some of the juiciest and most flavorful ones I've ever eaten. So, when my friends at Urban Accents sent me some samples of their new brine kits, I was pretty excited to try them out. The first one I'm trying out is the Hot & Spicy Habanero Brine, which according to the package works well for pork and poultry. 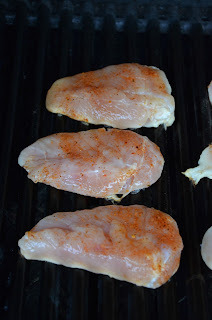 I always have boneless skinless chicken breasts on hand, so decided to give it a go with those. The directions recommend placing it in brine solution in the refrigerator for 6 to 24 hours (the longer the spicer). Mine was in there for about 21 hours. I like spicy, but wondered if it might be too spicy for me after that long soak. After you remove it from the fridge, you rinse and pat dry and then sprinkle a little more brine spice over the meat before baking or grilling. I went easy on a couple pieces just in case. We decided to put the chicken on the grill and have a nice meal outside on the patio. Hubby put the chicken on the grill and I made some baked Yukon gold potatoes (served with some sour cream, cheese, bacon bits and fresh chives from the garden) with a side of Fire Roasted Vegetables with Balsamic Butter Sauce from the freezer section at Trader Joe's. I love spicy and this looks awesome, great job!